Helen and Dickinson Bishop Survive An Earthquake and the Titanic - History? Because it's Here! Fate seemed to bombard Helen Walton Bishop and her husband Dickinson H. Bishop with tragic events, including a California earthquake, a stateroom on the Titanic, and an automobile accident. All of these misfortunes in their lives occurred between 1912 and 1916. One of the foremost Sturgis, Michigan, businessmen, every year Jerold P. Walton sold at least 200,000 of his royal plush button chairs manufactured in Sturgis and his furniture business provided hi family with a comfortable life. Helen, his only child, lived in Sturgis all of her life. When she was 19, Helen Walton met and married widower Dickinson H. Bishop who had inherited Round Oak Stove Company of Dowagiac money from his deceased wife. According to the Dowagiac Daily News, the November 7, 1911, wedding of Dickinson Bishop and Helen Walton was “the most notable ever held in Sturgis, Michigan,” and the society writer described the wedding in orange blossom detail. After they returned from their wedding trip the Bishops planned to live in a comfortable house on Main Street in Dowagiac, Michigan. For a wedding trip, the bride and groom sailed on the White Star liner Adriatic from New York City and traveled for three months in Egypt. After their Egyptian tour, the Bishops crossed over to Europe and journeyed to Cherbourg, France, timing their arrival to board the new White Star liner Titanic for the return voyage to New York. The Bishops settled into Cabin B-49 in the first class passenger section. The night of April 14, 1912, began routinely for Titanic passengers, including the Bishops. Helen, now newly pregnant, had gone to bed and Dickinson sat in their stateroom reading when the Titanic collided with the iceberg. After several trips back and forth from their stateroom to the deck, the Bishops came back on deck and Titanic officers loaded them into the first lifeboat, Lifeboat No. 7. Helen and Dickinson were the first couple to board and three other newly married couples boarded as well. 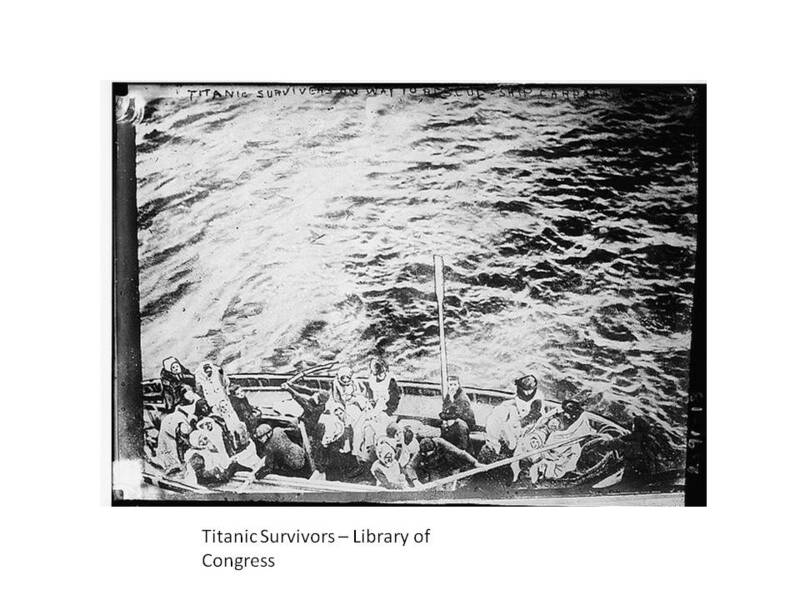 The Titanic passengers hesitated to climb into the lifeboats which dangled 75 feet above the dark ocean and several of them still believed that the Titanic couldn’t sink. The Bishops clambered into Lifeboat 7 which eventually contained 28 passengers, less than half its capacity, when crew members lowered it at 12:45 a.m.
Lifeboat No. 7 had only three crew members aboard, so Helen Bishop and several other passengers helped with the rowing. Helen noted that Pierre Marechal, the French aviator, left his monocle in place even while he rowed, while Alfred Nourney, acting the part of a German baron, sat smoking and refused to row. The Bishops and the other occupants of Lifeboat No. 7 were afloat from about 12:30 Sunday evening until 5 o’clock Monday morning. Although Lifeboat No. 7 left the Titanic first, it was the fourth lifeboat that the Carpathia picked up. The Waltons were reassured to learn of their daughter and son-in-law’s survival and hurried to New York to meet them at the Waldorf Astoria Hotel. The Bishops returned to New York aboard the Carpathia and testified at the Senate inquiry into the sinking of the Titanic. Dowagiac born Michigan Senator William A. Smith headed the inquiry which took place on April 30, 1912. In December 1912, Helen Bishop gave birth to a son who lived for only two days. Later, while vacationing in California, the Bishops were caught in an earthquake, which fulfilled the second part of the Egyptian fortune teller’s prophecy. On November 15, 1913, Helen and Dickinson Bishop were returning to Dowagiac from Kalamazoo, Michigan, in their car when it careened out of control and hit a tree. Thrown from the car, Helen suffered a fractured skull and doctors said that she wouldn’t survive her injuries. Her doctors put a steel plate in her skull, but her injuries changed her mental faculties and personality and her marriage suffered. She and Dickinson Bishop divorced in January 1916. After a voyage through the West Indies and the Panama Canal, Helen Walton Bishop visited friends in Danville, Illinois. She fell, which aggravated her injuries from the accident and her friends called in specialists from Chicago. For a second time, her parents, Mr. and Mrs. Jerold Walton, prayed for their daughter’s survival, and rushed to her side. They managed to arrive at her bedside before she died on March 16, 1916. Helen Bishop was 23 years old. An article announcing Helen’s death appeared on the front page of the Dowagiac Daily News, the same page that featured the wedding announcement of Dickinson Bishop who had married his third wife, Sidney Boyce of Chicago. Dickinson Bishop served in World War I. He lived in Ottawa, Illinois for many years, died in 1961, and is buried at the Ottawa Avenue Cemetery. Helen is buried in Sturgis, Michigan. Lord, Walter. A Night to Remember. Penguin, 1976.